It all started right here. On February 17, 1869, Cleveland Public Library officially opened on the third floor of the Northrup and Harrington Block on West 3rd Street and Superior Avenue in downtown Cleveland. 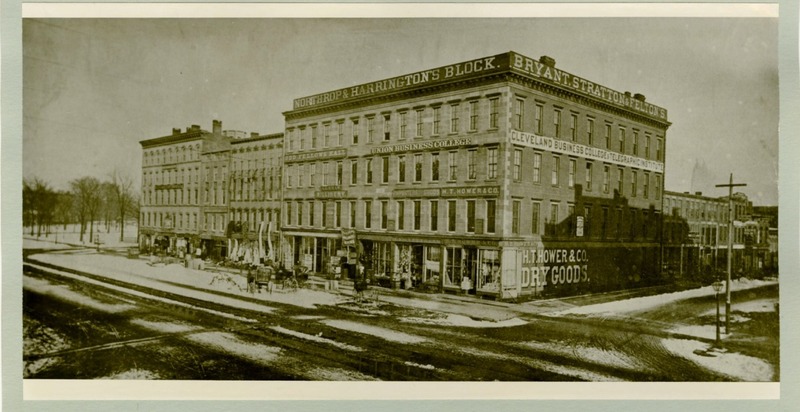 The first two floors were occupied by the Hower and Higbee department store. (In this photo, Public Square can be seen in the background on the left.) According to Open Shelves, Open Minds: A History of the Cleveland Public Library by C.H. Cramer, the Library opened with about 5,800 books in a space of 20 by 80 feet. From these humble beginnings, the Library has grown to include the Main Library campus downtown (including the historic Main Library building, which opened in 1925, and the newer Louis Stokes Wing), twenty-seven branch libraries, the Public Administration Library, and the Ohio Library for the Blind and Physically Disabled. Today, Cleveland Public Library maintains a collection of millions of books and other resources, serves millions of patrons, and the Library offers thousands of programs annually. Not too shabby, right?